Moving into the air doesn’t prevent from being tracked. Admittedly I’m not absolutely sure but Apple’s ‘Find My Friends’ won’t work. So who else than Google or Apple is tracking you? It’s not the NSA (No Security Any longer) but the FAA (Federal Aviation Administration) or other companies like Flightradar24, and in this case you should be happy that someone takes care of your position. An estimated 800k people are airborne worldwide (source The World Bank, 2013). That is a phenomenally large number and it pretty much illustrates the gigantic magnitude of the global aviation industry. In such a crisscross maze of simultaneously flying aircrafts, it’s absolutely crucial for each airline to keep track of all its aircrafts, their locations, trajectories and safety. Each airline has a special team, that is exclusively designated the task of tracking its aircrafts. Airline carriers and specialized companies around the world offer real-time flight tracking services. Here are some of the techniques on which most of the flight tracking systems are based. Of all techniques, the radar based flight tracking system is the most common as well as the most conventional method used worldwide. The system is also known as ground based tracking or radio frequency tracking. This method utilizes the age-old and time tested fundamental of radar waves for tracking and communication. For this, ground based stations, better known as Air Traffic Control or ATC towers, signal radio emit waves at a predetermined radio frequency. These emitted waves return after tapping the airplane. Even airplanes are equipped with systems to emit a code, which is then used to identify flight details like location and altitude. The landing and take-off time of each airplane is also determined by both pilots and ground-based stations using this system. The distance of the plane from the ground is calculated based on the time duration between the release and reception of the frequency from the base. This technique is perfect in almost every respect, except for hurdles like expansive mountains, forests, and oceans that make the journey of radio waves a bit difficult. As is the case with traditional flight tracking systems, satellite-based tracking also involves the measuring of time-space-position data, related to the aircraft. However, what is unique in its case is the fact that all these activities are performed by satellites and not by ground-based locations. Consequently, satellite flight tracking eliminates quite a few shortcomings which otherwise, are prevalent in other tracking techniques. It involves the use of satellite transmitters, receivers, decoders, two-way communication antennas and microprocessors, all of which work in synchronization with the satellite stations. It also involves the use of detailed graphic images, contour analysis, etc. which results in accurate tracking of the flights. Google Earth is a revolutionary concept. Numerous software applications have been designed, one of which happens to be a real-time flight tracking system. This application makes use of the 3D visuals of the Earth, which are generated by Google Earth, in conjunction with other position-mapping algorithms to ultimately present a visual representation of the flight location, flight path, etc. It also provides additional flight data such as flight origin, destination, departure time, estimated arrival time, altitude, speed, etc. Google Earth has been an inspiration to several other websites, which now offer real-time flight tracking services over the Internet. All that one has to do is simply enter the relevant flight details on the user interface of the website, and within a few seconds, the website displays a virtual path of the aircraft along with all the relevant tracking and monitoring data. One can sit back and enjoy the virtual experience of following the aircraft’s flight path, as it heads towards its destination. 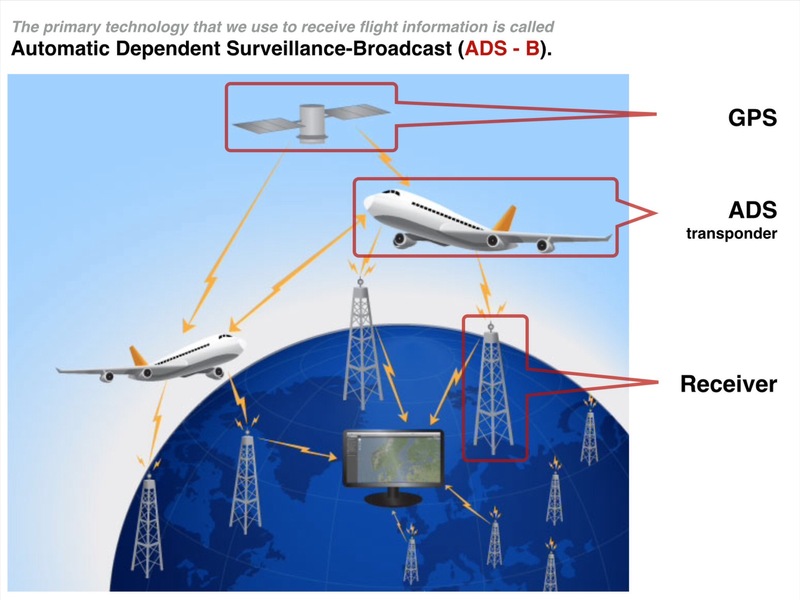 The primary technology that we use to receive flight information is called Automatic Dependent Surveillance-Broadcast (ADS-B). The ADS-B technology itself is best explained by the image below. An Aircraft gets its location from a GPS navigation source (satellite). The ADS-B transponder on aircraft transmits signal containing the location. ADS-B signal is picked up by a receiver. Receiver feeds data to different databases. In some regions with coverage from several FR24-receivers we also calculate positions of aircraft with the help of Multilateration (MLAT), by using a method known as Time Difference of Arrival (TDOA). By measuring the difference in time to receive the signal from aircraft with an older ModeS-transponder, it’s possible to calculate the position of these aircraft. Four FR24-receivers or more, receiving signals from the same aircraft, are needed to make MLAT work. That means that MLAT coverage can only be achieved above about 10000-20000 feet as the probability that signal can be received by four or more receivers increases with increased altitude. Aviation industry analysts are of the opinion that satellite-based tracking in collaboration with global positioning system (GPS) will become one of the most advanced, accurate and reliable flight tracking techniques in the days to come. Frequently changing atmospheric conditions, turbulence and diverse flying conditions, make real-time flight tracking an absolutely crucial aspect of aviation. 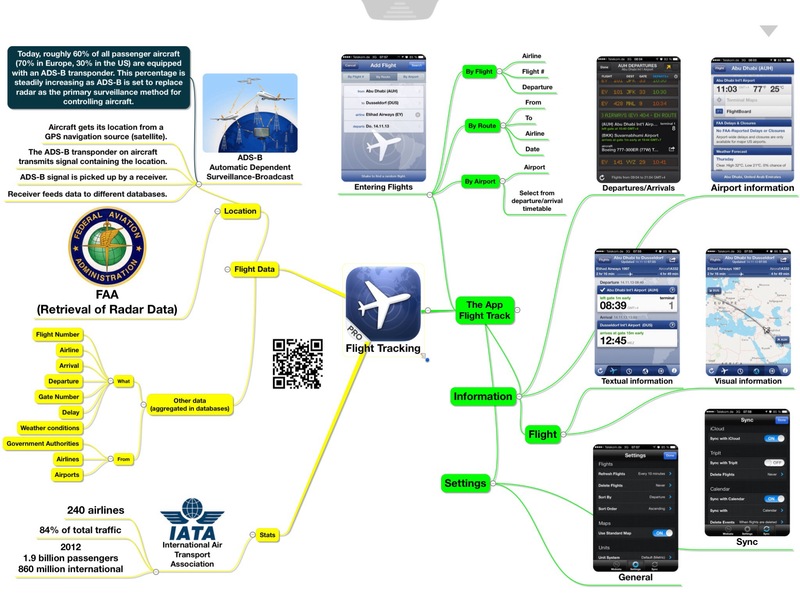 I summarized some relevant topics of flight tracking in a mind map. All of the above mentioned methods are used to track airplanes, maintain coordination between them, and thus control air traffic. It is because of these air traffic tracking systems that airplanes are known as the safest option for traveling. Moreover, the rising unpredictability of nature due to global warming and threats due to increased terrorism also demand sound air traffic control systems for the utmost safety of airplanes and passengers. There are two kinds of apps available at Apple’s App Store, one for people just needing the important information for planning their flights and one for tracking flights all over the world with comprehensive information about airports, carriers, and flight data. The app Flightradar24 by Flightradar24 shows live airplane traffic from different parts around the world. There is a free and a paid PRO version available. 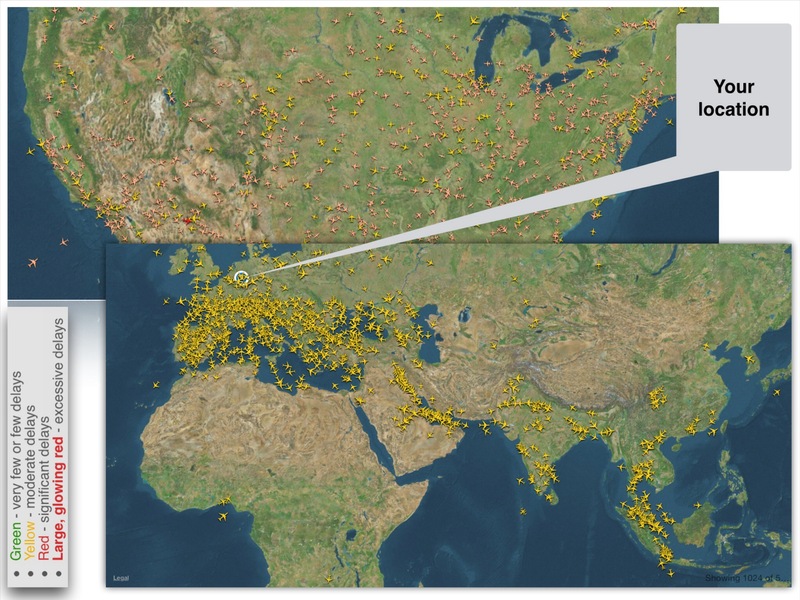 The technique to receive flight information from aircraft uses ADS-B. That means the app can only show information about aircraft equipped with ADS-B transponders. Today about 60% of the passenger aircraft and only a small amount of military and private aircraft have an ADS-B transponder. At the time Flightradar24 operates about 2000 receivers all over the world. About 98% of Europe is covered with ADS-B receivers. There is also a more or less good ADS-B coverage in USA, Canada, Caribbean, Brazil, Russia, Middle East, India, Japan, Thailand, Malaysia and Australia. Most of the data about air traffic in the USA are retrieved from the FAA (Federal Aviation Administration). With the app FlightTrack by Mobiata, USA you can plan your flights by entering some data like date, flight number, etc. Flights can be synced with all your other iOS devices via iCloud, each record can generate a calendar event, and an alert comes up if you should start to prepare for launching. 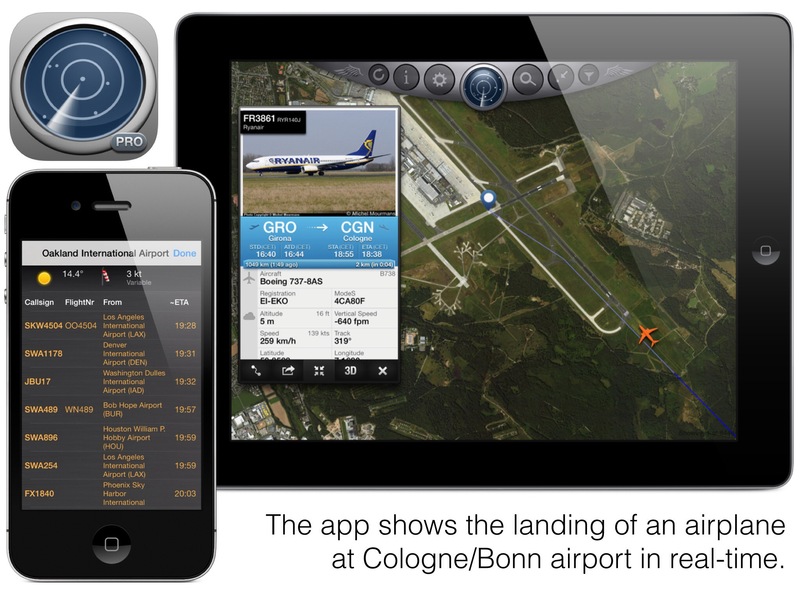 Additionally the app shows the flight boards of origin and destination airports in real-time. 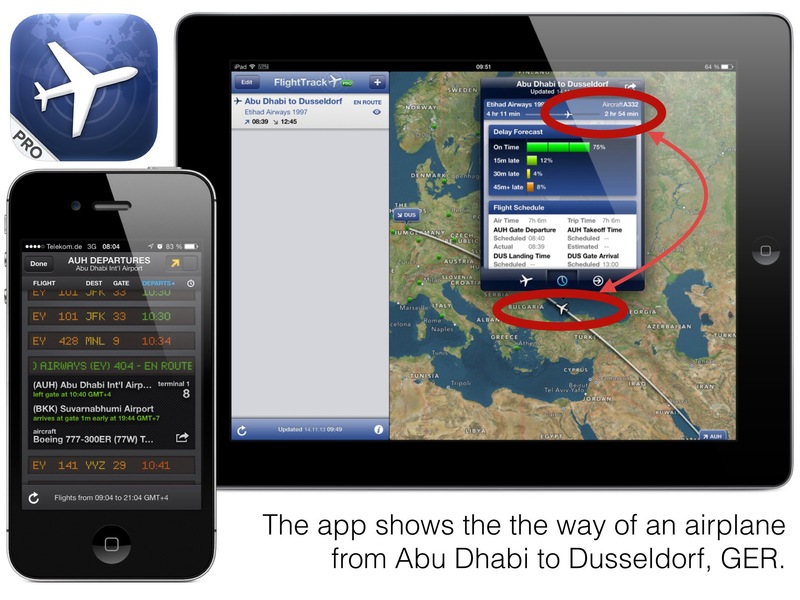 I use the app FlightTrack since 2 years and provided information is perfect for nearly all airlines all over the world. Just in time for our 5-year anniversary, we’re pleased to introduce FlightTrack 5, our brand new FlightTrack app available for both iOS and Android. Rebuilt from the ground up, the team has worked hard over the last year to improve our features and design. Designed for iOS 7 and Android Holo. Group flights into trips and customize trip names. Easily distinguish who is traveling on specific flights. See which flights have Wi-Fi onboard. View actual flight paths (when available). We’re consolidating all the goodness of FlightTrack ($4.99) and FlightTrack Pro ($9.99) into one new product. To celebrate this big update, we’re offering you the new app at a discounted price of $2.99 until December 1, 2013, after which the app will be available for $4.99. Both reviewed apps depend on the information published by carriers, airports, and the mentioned external technical equipment. So it might happen that your flight is tracked but without additional information like departure time, gate number, arrival time, or weather conditions at the destination airport. Thanks for landing at iNotes4You.